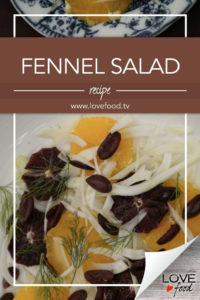 Remove the feathery fronds from the top of the fennel, roughly chop and set aside. Using a vegetable peeler or pairing knife, remove any imperfections from the outside of the fennel bulb. Remove core, as you would a cauliflower, then thinly slice bulb, using a mandolin or sharp knife. Remove pits from olives. Of maybe they’ve come pitted. Even better. Scatter fennel and orange segments over a serving platter. Top with olives and a swirl of olive oil. Then, sprinkle over lots of sea salt.